Manufactured from extremely durable Polyethylene, the Trunk box is a versatile carrier providing vast carrying capacity for your ATV. Its design allows easy access to the rear of the bike so lends itself perfectly to those who need to attach a trailer. With our “quick fit and release” bungy system it is practical, value for money and simple to use; the Wydale trademark. 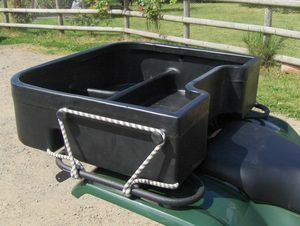 All Terrain Vehicles are of great benefit to a busy farmer, but add some Wydale ATV carriers and you can change your workhorse into a packhorse in less than a minute. All the carriers are one-piece moulded in rugged polyethylene making them rust proof and maintenance free.